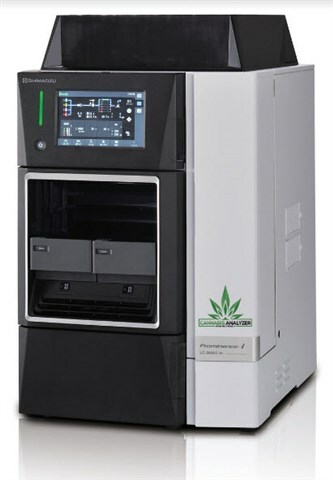 Shimadzu Scientific Instruments (SSI) announces the release of its new Cannabis Analyzer for Potency. This high performance liquid chromatograph (HPLC) is the first-ever instrument designed specifically for quantitative determination of cannabinoid content. With the Cannabis Analyzer for Potency, operators are now able to produce accurate results with ease, regardless of cannabis testing knowledge or chromatography experience. The Cannabis Analyzer for Potency is a comprehensive package integrating instrument hardware, analytical workflows, and supplies, including an analytical column, guard columns, mobile phase, and a CRM standard mixture. After one day of installation and testing, users are equipped with everything they need to obtain cannabis potency results. Operators save valuable lab time because they don’t have to develop quantitative testing methods. Included methods have been confirmed for ruggedness, repeatability, and quantitative accuracy. The analyzer’s workflows address three analysis goals: high sample throughput, enhanced sensitivity, and resolving power for myriad cannabinoid targets. The High Throughput method package is designed for the quantitative potency determination of the 10 cannabinoids of greatest interest in less than 8 minutes per sample. The High Sensitivity method package adds THCV to the target analyte list, with an analysis time of 10 minutes. The High Resolution method package presents full baseline resolution for all 11 compounds in less than 30 minutes and offers the ability to expand the target list as regulations change. A dedicated user interface simplifies the workflow and reduces the number of steps in the analysis. The Cannabis Analyzer for Potency is designed for maximum uptime, economical to own and comes with a three-year warranty and preventive maintenance plan.